A Delightful Terror - Would you let this fierce looking thing into your house? - “Michael Harrington Describes An Old Time Christmas In Newfoundland.” The Daily News, Wednesday, 5 Jan, 1955. Page 2. I'm working on my next book, a collection of stories, memories and photos about mummering and related Christmas traditions in Newfoundland and Labrador. 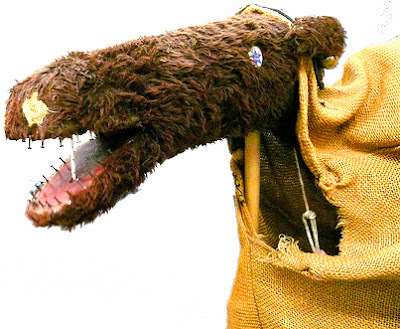 And right now, I'm working on a chapter about the hobby horse. When most people today think of a hobby horse, they think of the child's toy - a horse's head on a stick. But in Newfoundland, the hobby horse was, and is, part of the holiday season house-visiting tradition. Indeed, hobby horses (along with their colourful cousins hobby cows, hobby goats, hobby sheep, and hobby bulls) have been here on the island of Newfoundland for a long time. The jannies make what they call a 'hobby horse.' They have the head of a horse, cow, or moose with a piece of canvas attached to it. About six men get under the canvas. They put nails or something like that in the mouth to make a clacking noise. They put sticks or something in the head so that they can turn it and open and close the mouth. Then this fierce looking thing goes around to the different houses. If you have a memory of a hobby horse or hobby bull, email me at dale@dalejarvis.ca. Or if you have a photo of one you've made, send it along! Looking through family Christmas photo albums? Keep an eye open! I posted earlier how I'm working on a book about Newfoundland and Labrador mummering traditions, and how I'm looking for people with memories and stories. One thing I'm also looking for is photographs from old time Christmases in the province, like this gem above, from the Winterton museum. I know holidays are one time when people dig out their old family photographs and reminisce. If you do happen to be looking at old photograph albums, keep your eyes peeled for me. 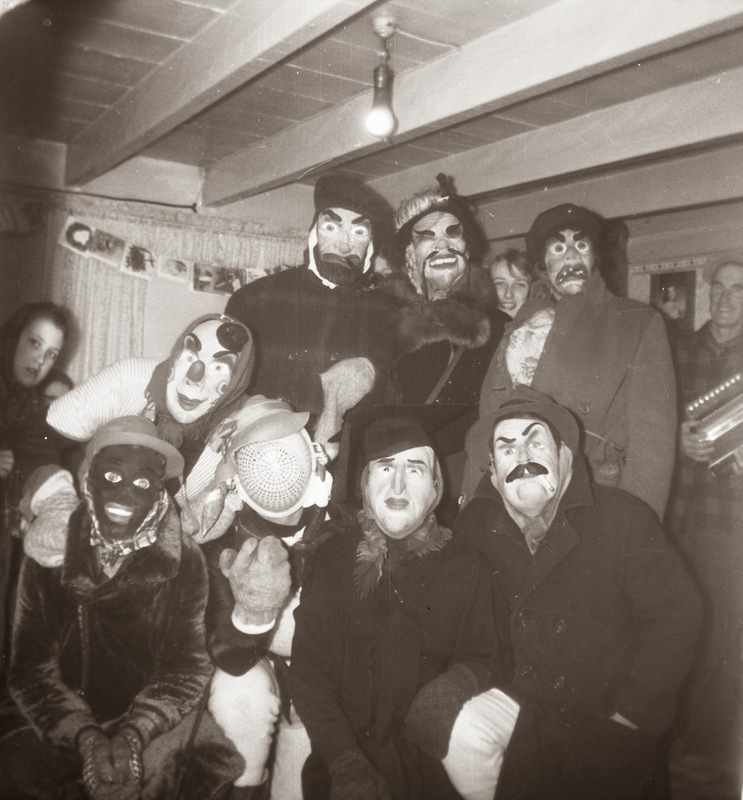 I'd love to find some old family photographs of mummers, janneys, or other Christmastime or New Years traditions, like shooting off guns on New Years, or nalayuk night in Labrador. If you find something, let me know; I'd love to see it! You can email me at dale@dalejarvis.ca. As Christmas time rolls around in Newfoundland and Labrador, your chances of seeing someone dressed in a very strange costume increase dramatically. These are padded figures, with humps on their backs, protruding bellies, shoes on the wrong feet, their auntie’s bra on the outside of their clothes, with faces hidden behind masks or bits of old lace. These figures might be called different names in different parts of the province: mummers, janneys, darbies, or fools. It is an old tradition, which has faded in many communities, but at the same time, it is one which many people are reluctant to abandon completely. Folklorist and storyteller Dale Jarvis is one of those people. The author of several books on local ghost stories, legends and folklore, he is now turning his attention to the province’s most beloved Christmas tradition. This holiday season, he is doing research on mummering, with the aim of producing a book on the subject in time for next Christmas. Jarvis has been digging through archives and old newspapers, and interviewing people with memories about the different aspects of mummering. Jarvis is interested in all these different types of Christmas traditions, and is turning to the public for help. If you have a memory to share, you can contact Jarvis by phone at 709-685-3444 or by email at dale@dalejarvis.ca. Or, if you have an old photo you want the world to see, you can post it in the Vintage Newfoundland Christmas group on Facebook.